History: An owl has been roosting in the palm trees for years. The pellets of rodent bones and fur litter the ground below. It would swoop out of the tree at dusk and soar up and down the canyon almost every night. In April 2008, shredded leaves dropping from the trees prompted the erection of a nesting box. It was mounted on a 20ft pole under the pine trees near the palms. 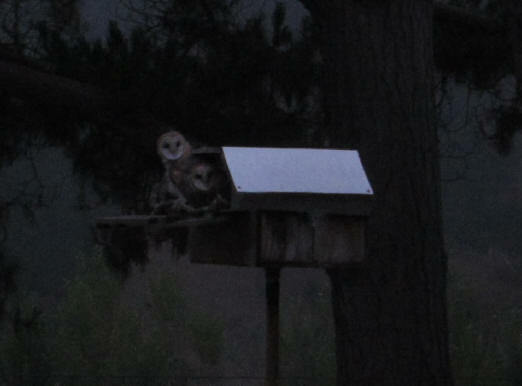 2009 Owl Story & Pictures - The mated pair raised their brood of five babies. 2010 Owl Story & Pictures - Our owl couple raised another family of five owlets. 2011 Owl Story & Pictures - Five again! 2012 Owl Story & Pictures - Three this time. 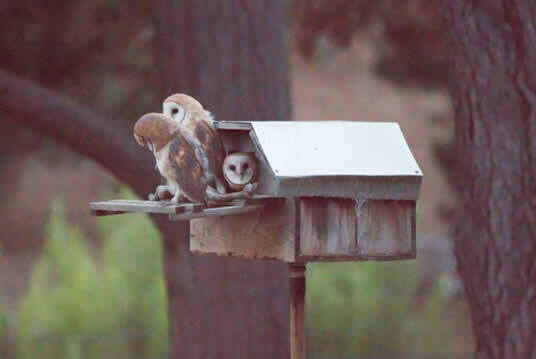 Audubon Barn Owl Webcam - This live webcam often shows owlets in the nest... about the same age as ours. Novemer 2012 - There were big changes around the nest box since last season. The huge pine tree with two trunks was leaning towards the house and was taken down. It exposes the nest box to more sun and wind. 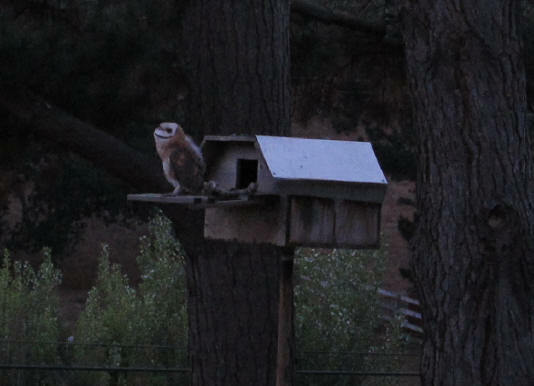 But the owl couple didn't mind, and moved in during late March as usual, with the female roosting inside during the day. Apr/May 2013 - The female owl can be seen peering out during the day, and is heard softly screeching after dark waiting for her mate to deliver dinner. Mid May we can hear tiny baby noises. May 27th 2013 - Both parents are roosting in the palm trees again. The babies must be big enough to eat by themselves. At least three distinct voices can be heard inside. 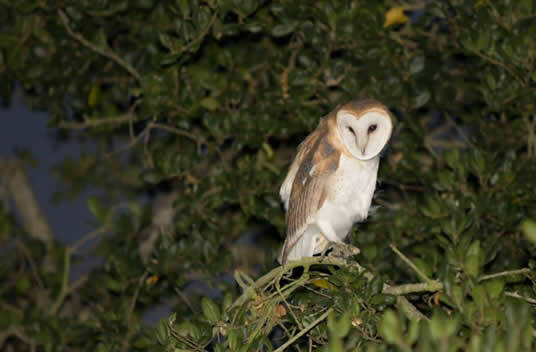 The first few nights, the female starts screeching early, forcing the male to leave early to hunt. She later lands on the nest box or in a nearby tree, staying close to home. June - 1st week - a fluffy owlet can be seen shuffling around in the nest box, looking out with big dark ringed eyes. 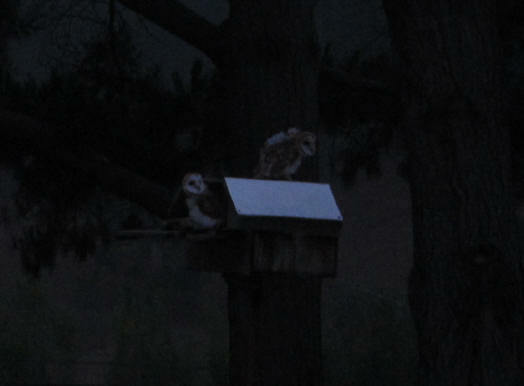 June 24th - A couple of owlets can be seen jumping and flapping their wings inside before dark. At dusk two emerge, #1 testing his wings, flapping furiously. #2 escapes the flurry by hopping up on top of the nestbox. June 25th - The next morning the owlet is still on top of the nest box... and its sibling is on the ground. It hopped along, over the compost pile to the other side of the fence. Harassed by blue jays, it wandered into the trees, and by flapping its wings, climbed up a huge eucalypus tree. It was spotted at 1pm at the top of a thin limb, wings out, swaying in the breeze... looking around. 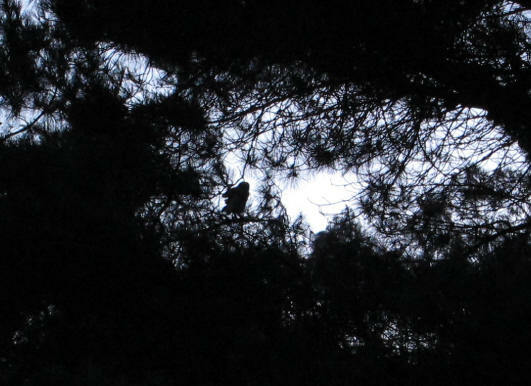 Shortly before dusk, it was seen about 3 stories up in the tree, looking exhausted after staying up most of the day. It was staring at the pine tree next to the nest box. 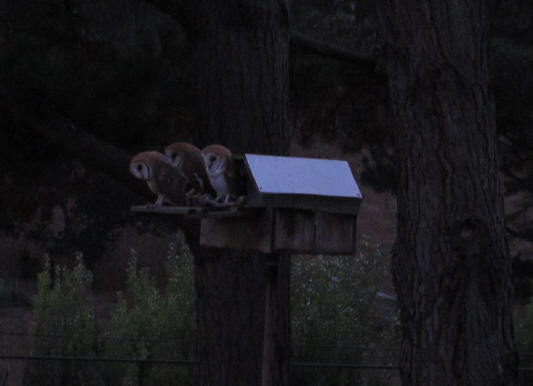 At sunset, when the birds stopped chirping, the owlets in the nest box started screeching and came out. Their sibling came soaring in from the huge tree and landed in the pine tree above the nest box (nice landing!). Owlet #2 flew from the nest box to the branch of the pine tree to practice its own flying skills. 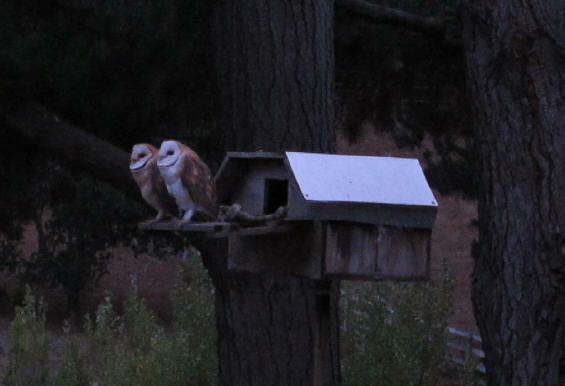 #3 held on to the nest box furiously flapping its wings until dark. In the morning, the box looked pretty crowded, so we think everyone made it back safely before dawn. June 26th - It's official... a total of three babies again this year. The young owls still have a lot of fuzzy white down sticking out in between their feathers. They start screeching and pile out of the nest box at dusk, flapping their wings before flying to the pine tree branches. #1 and #2 make it easily, then hop from branch to branch practicing their moves. #3 has yet to to fly anywhere as of 9pm... but it will be soon. June 28th - 5am all three owlets are in the pine tree getting ready to roost in the nest box. #1 and #2 fly perfectly to the top of the box and go in. #3 stays out a little longer, gathering the courage. It takes off, and misses high, landing in the oak tree behind the next box. After a few minutes, it swoops back to the pine tree for another try... this time making it to the nest box. All three little ones are flying now! 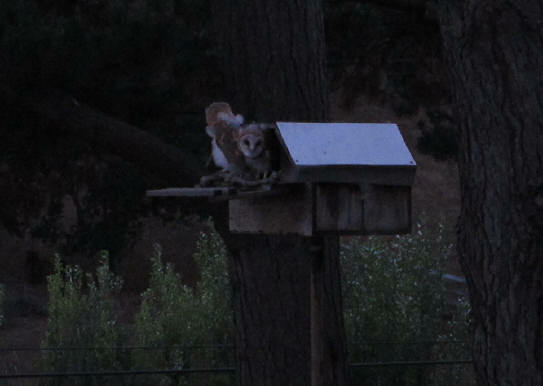 June 28th - The first owlet to emerge from the nest box at dusk, looked up at a familiar screech, and spotted its sibling, who must of roosted in the pine tree all day. Another baby came out to join the other two in the pine tree, hopping from branch to branch, screeching for food. 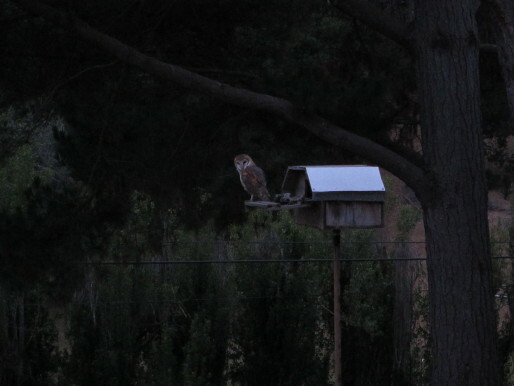 June 29th - All three came out of the nest box in the evening, and checked out the neighborhood from their perch before flying to the pine tree... one by one. They are testing their skills and fly from tree to tree in the front yard. Their landings are getting better every day. The babies don't seem to be as loud this year, or maybe they are being fed more and aren't as hungry. 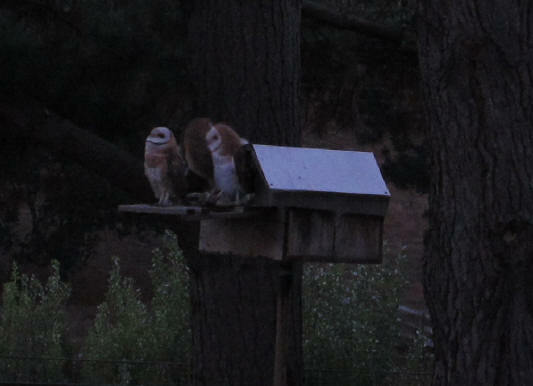 July 4th - The noise of nearby fireworks didn't keep the baby owls from coming out of their nest box at the usual time. You can tell how the oldest one's breast feathers are darker than the white chest of the youngest. They are growing up fast! They fly off the property to neighboring trees, practicing take offs and landings. They will be learning to hunt soon and will need good flying skills. July 5th - 8th - Every evening all three owlets come out of the nest box and practice flying around and around... showing off to each other. They screech back and forth, and really make a ruckus when their parent shows up with a rodent. The feeding noises can be heard several times during the night... pretty darn loud! July 9th - Only one owlet roosted in the nest box during the day. The other two were in the palm tree with the parent. They screeched loudly when the parent made a move to leave, and it tried to quiet them down by twittering. When the baby flew from the nest box to the pine tree, the two in the palm flew out and joined it. When the parent flew by, they all screeched 'wait for me!'. 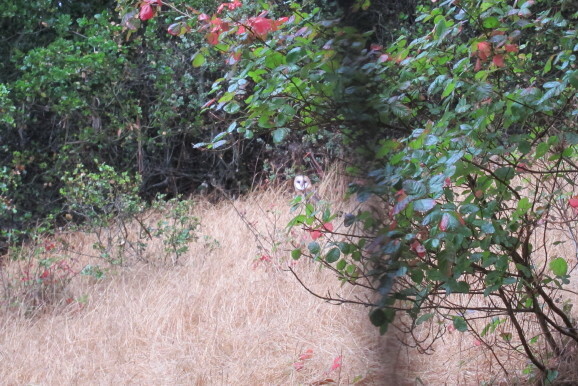 July 13th - 8:30pm our dog, Reo, was barking excitedly in the back yard. An owlet was perched on the roof above her, just watching her. They are more curious about what's happening on the ground lately. July 14th - All three babies roosted in the palm tree (with one parent). They stayed close, flying lower around and around the yard, screeching at each other. July 15th - Only two young ones came out of the palm tree. The oldest one must be roosting elsewhere now. They flew low, taking turns curiously hovering over a cat in the yard, before continuing to practice flying. 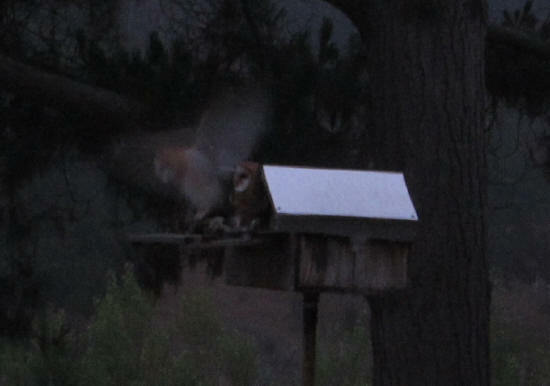 July 16th - One owlet flew out of the palm tree to the nest box, where another emerged at dusk. They watch something on the ground for awhile before flying low around the yard, perching on garden stakes. They seem to be aware now that their food is on the ground, and are interested in hunting.